The interior of The Snowdon. The Welsh Den Company will be exhibiting in the Farm Business Innovation Show in Birmingham, on the 9th and 10th of November. 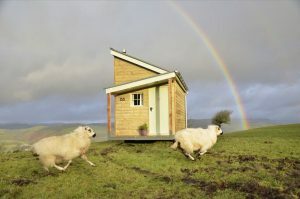 One of the latest companies to enter the building market for tiny houses is from the somewhat unlikely location of Wales. The Welsh Den Company was launched earlier this year and is currently taking orders for their unique take on small living. 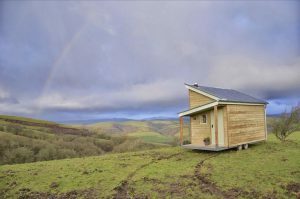 If you’re not quite sure how to get your tiny house from Wales to your chosen location – no worries; completed homes can be delivered throughout the UK. 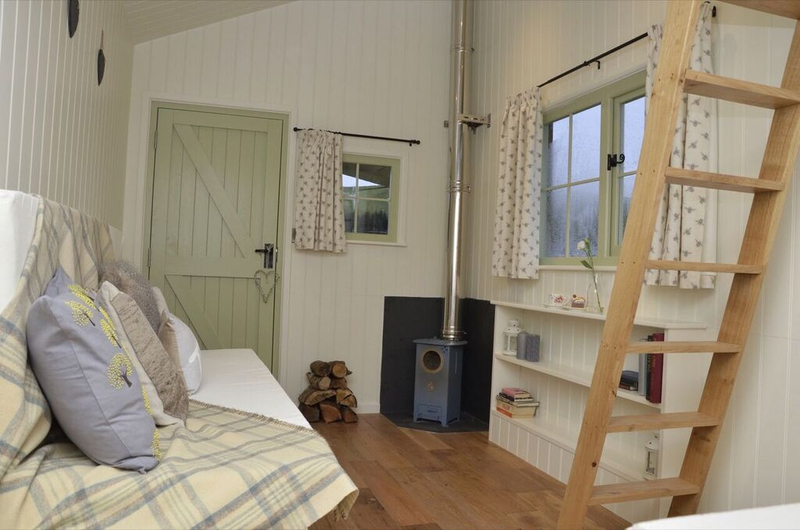 Although clients can request variations to suit their particular needs, the flagship of the Welsh Den Company is “Snowdon.” This model features an interesting roofline, with slanting angles forming the roof and the front porch area. This unique angular design, allows for a bit more interior height and space, besides providing an interesting visual feature. The houses are placed on wheels for the purpose of transport, but also to comply with current planning restrictions. If planning permission is obtained for a static structure, the wheels can easily be removed from the design for a more permanent home on a foundation. One very unusual feature of the home is the traditional Welsh slate roof. The roof does add to the overall weight of the building, and towing the home on a regular basis is not advised. It can however, be moved from site to site on one’s property or towed to a semi-permanent location. The rather unusual choice of slate for the roof material is due to the longevity of the material, (most slate roofs are estimated to last at least 50 years without any major repair). Also, slate is especially fire retardant. Another important reason that The Welsh Den Company chose slate is their desire to promote all things Welsh. 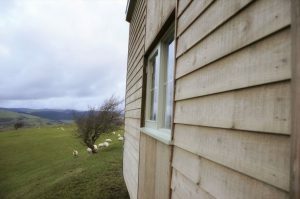 The homes also feature natural sheep’s wool in the walls and ceiling for insulation, resulting in a cosy residence, even in the face of tough Welsh winters. The slate roofs, sheep’s wool, and Chilli Billie Penguin Wood Burning Stoves (based in Gwynedd) were all purposely chosen to help support the local and UK economy wherever possible. Additionally, the feather-edge soft wood cladding is locally sourced timber. The owner and founder of the company, Rhys Wright is from the local area and learned the building trade from his grandfather in a very traditional way. He has owned and operated RBW Carpentry for many years before deciding to launch The Welsh Den Company which specially caters to small space living ideas. Interestingly, Rhys lived in a tiny house of his own creation for three years. His story is very similar to many young people of today, who cannot afford to purchase a home of their own. He decided to build his own little “chalet” and has been interested in small space design ever since, tweaking and refining his ideas. Though many people associate tiny houses with young, first-time homebuyers, many people at the other end of the spectrum are also interested in this lifestyle. Retired people who no longer have children living with them are downsizing to have more time for travel and less financial burden of high utility costs, insurance and maintenance. The homes are also being used quite efficiently for “Granny Annexes,” for mature individuals who are still quite independent, but desire to live close to their grown children. This is often a winning situation for everyone, as aging parents are able to enjoy greater privacy in a tiny house while children are close by if needed. Many grandparents also provide invaluable support with child care, and the tiny house puts them in close proximity. The launch of the company appears to be one of several interesting things that are happening in the region right now with regards to tiny homes. The Centre for Alternative Technology was host to the recent ‘Small is Beautiful Fest’ held in September. The Centre also offers classes periodically in how to build a tiny house from the ground up. The Snowdon takes approximately four weeks to build and can be constructed with 12 volt solar and off-grid plumbing if so desired. For more information visit www.TheWelshDenCompany.co.uk.